We’ve had a really warm, delicious and even hot summer. And one of the joys of summers like this is lying in a paddock or an orchard and looking up at a tree. So this is the emotion we wanted to capture in this gin. The red clover gives a little hint of hay and the laziness of summer, while the tangelos bring lushness and a feeling of the generosity and abundance of the summer we’ve had. With the red clover flowers, when we picked these, we noticed the bees weren’t going for the brightly coloured pink flowers, but were landing on the darker ones. These turned out to be sweeter, beautiful like honey. It was fun to harness this and also play with various techniques for extracting flavour from the tangelos. In 2018, we used New Zealand native birds hand drawn by Craig Jones of Strategy Collective for our labels. 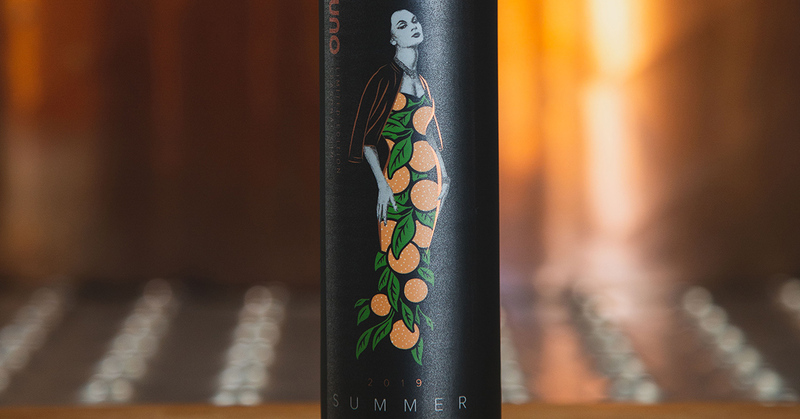 This year, we really wanted to hone in on the goddess idea of Juno, so we’ve decided to feature a stunning woman wearing a long gown adorned with tangelos—she’s classy but also wouldn’t mind kicking of her heels and running through a field full of flowers.